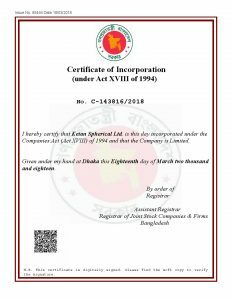 Limited Company is the largest business entity in Bangladesh. Generally, two or more entrepreneurs are joining together and open a business platform by forming a Limited Company in the country. Joint stock company registration authority (very much known RJSC) also approvals of nonprofit organization and issues necessary certificates of different organization in Bangladesh such as Incorporation Certificate, Society Registration, Annual Return Filling, Certified Copy issue, Company Authorized Capital increase and so on. Name Clearance is the first step for register of a Company, Partnership Firm, Society or a Trade Organization. If entrepreneurs want to open a new entity ( it may Company, Partnership Firm, Society, Foundation) have to need Name Clearance from RJSC for approving name clearance for the proposed name of the company which is not similar or closely match or resemble into the existing company, it may written, pronounce or viewing all the measure. The RJSC provides partnership firm registration and issues Certificate. Partnership business must be needed 2 (two) to 20 (twenty) entrepreneurs for operating the business. Partnership firm registration is followed by Partnership Act, 1932. Company registration is the first steps of a Limited Company setup in Bangladesh. In General, two or more entrepreneurs wants to start a limited company business in Bangladesh. Basically, two kinds of limited company available in the country, Privet limited company and Public limited company; Privet limited company has to at list 2(two) Members or Share holders and highest 50 (Fifty) Members or Share holders in the company and public limited company has at least 07 (Seven) Members or Share holders and maximum unlimited number of Members or Share holders limited by the shares following The Companies Act, 1994. Basically, Society is a non profitable and charitable organization for improving certain issues. Society registration is followed by Societies Act. 1860. There three kinds of society working in the country such as Trust, Society and Foundation. In general, Society works with social or professional or particular agenda for developing their mutual interest such Woman skills development, Human resource Society, Doctors Association , Village development program etc. Trade Organization is a business platform which registered by RJSC. Generally, same kinds of Business Company are jointly created a platform for developing and understanding their mutual interest of particular business issues. Trade organization registration is followed by Trade organization Ordinance, 1961. The Share Allotment is one of the most important jobs for Joint Stock Company. It’s a continue process of adding new Shareholder/ Directors or increasing paid-up capital or business capital into the limited company. The RJSC authority approved share allotment for increasing business capital of the company. First of all, board Directors taking decision to add new Directors or increase paid-up money within existing Directors or Shareholders. The share Allotment / share increase is the ongoing process of Limited Company in Bangladesh which monitoring authority is RJSC. Existing Shareholder can take newly allotted share of the company or new shareholder coming into the company by taking new allotted share. If someone got, director qualifying, number of share she/he could be director of the company. Company’s shareholder/ director aged must be 18 (Eighteen) years, no bankrupted and has to mentally sound. Company Share Transfer is an ongoing process of Joint Stock Company. If someone (who is Director/Share holder of the company) wants to transfer his/her partly/ hole numbers of share to another person or existing Director and not wants to stay in this company as Share Holder or Director, at that time he/she could leave his/her entire share to another person. Generally, company’s existing share holders/ Directors want to purchase this particular share otherwise outside person can be involved as new share holder or director by purchasing of transferring share of the Joint Stock Company in Bangladesh. Joint Venture Company is one of the parts of Joint Stock Company, when local entrepreneur and foreign entrepreneur, jointly forming a company, is called Joint Venture Company. For Joint Venture Company Registration needs encashment certificate of foreigner for equity investment and Joint Venture agreement within foreigner and Bangladeshi there indicates few business terms & conditions. Foreign Company’s Bangladeshi Branches, Subsidiaries or Representative Offices are such type of company structures which refer to foreign companies that may be opened in Bangladesh as either an entity from the parent company or the parent company’s extension office. In Bangladesh, Representative Office or Branch Office has to deposit money of USD 50,000/- to the company’s account or equivalent like estimated primary development cost and business opening cost must be coming from overseas country. At present, World’s renowned chain company opens their Regional Office, Liaison Office or Branch Office registration in the country. To know more Foreign Company Registration in Bangladesh. If board of director of the company wants to increase Authorized Capital, at first approve board resolution and submit to RJSC then to pay Govt. fees to the Bank. When needs to expand business at that moment must be essential more Authorized capital for developing business of the joint stock company. The RJSC approves Authorized capital and issues certified copy of the company. For increasing paid-up capital of the company issues Share Allotment to collect more business capital. There is no limitation of maximum and minimum authorized capital for opening Limited Company in Bangladesh. Each calendar year must be submitted company’s annual return to the RJSC; an Annual General Meeting must be organized into the board of Directors of the company. The AGM must be conducted within 18 months of the company date of incorporation from RJSC, after which no more than 15 months can delay between one AGM and to the another AGM. If any change in the board of directors or into the shareholders structure or any other changes, a relevant return must be filed to the RJSC within a certain period of time. A private limited company can be converted to public limited company, first of all board of director taking decision to convert public company from existing private company. (If a company being a privet company, having at least seven members after its articles in such manner that they no longer include the provisions which, under clause of sub- section 2 of this Act, are required to be included in the articles of a company in order to constitute it a private company, the company (a) shall as on the date of the alteration cease to be a privet company). If Managing Agent is appointed to be steeled salary on percentage of net profit, without profit or minimum profit there will be given minimum salary. All kinds of Company conversion activities are followed by Company Act, 1994. More winding up process are Member’s Voluntary Winding up, Creditor’s Voluntary Winding up, Winding up subject to supervision of Court; Company winding up activities is followed by Company Act, 1994 in Bangladesh. When the Registrar has found reasonable cause (such as annual audit, annual returns are not submitted for a long period etc.) to believe that a company is not continuing on business or in operation, sends to the company a notice (1st notice) for inquiring whether the company is doing on business or in operation of business activities. If the Register does not receive any answer of sending notice within (30) days to that matter, After finishing 30 days period of time, Register issues (2nd notice) for stating that to the company within 14 days, if there is no reply of 2nd notice within thirty days from the date thereof, a gazette will be published (official notice) for striking the company name off the register. If the Registrar receives an answer from the company that the company is not doing any business activities or business operation, does not receive any answer within 30 days after sending 2nd notice; the Registrar may publish the official Gazette and send to the company a notice, which expiration of ninety days from date of issuance, unless cause is shown to the contrary the company name mentioned therein will be struck off the register and the company will be dissolved, and thereby a copy of the notice may be forwarded to the company by the registrar while confirming the concerned authority of it to be published in the official gazette.